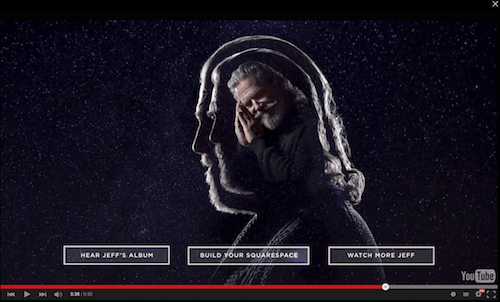 All-in-one website publishing platform Squarespace has announced a partnership with Jeff Bridges launching during Super Bowl XLIX. The collaboration, “Jeff Bridges Sleeping Tapes”, brought to life on DreamingWithJeff.com, features a unique album of relaxing sounds, guided meditations, and stories designed to lull you to sleep. The sleeping tracks are free to stream online as a ‘pay what you like’ release on Jeff’s Squarespace site and benefit Share Our Strength’s No Kid Hungry® campaign. Limited-run cassette tapes and vinyls will be available for sale on the website following the ad’s debut, and 5 special limited-edition vinyls will be auctioned off separately also benefitting the charity. 100% of the retail price (excluding shipping and service fees) from each album sold goes directly to No Kid Hungry. See the teaser spot below then keep your eyes peeled in the first half of the Super Bowl for the 30-second spot. We’ve been waiting with bated breath to learn which Super Bowl ads will feature a cause component and which brands do so most effectively. The Super Bowl is about being unique and unexpected; Squarespace certainly earns points for this offbeat approach. In this partnership, the inclusion of No Kid Hungry allows Squarespace to showcase their merchant account capabilities in a way that encourages consumer participation. Without the cause, that piece would either fall flat or cease to exist. And speaking of video at the Super Bowl, be sure to listen in to this week’s episode of Cause Talk Radio with See3’s Michael Hoffman to dig deeper into what works with cause and video and how it relates to Super Bowl ads.